The esthetic treatment of anterior teeth has always presented a challenge in clinical practice. With the improvement of dental materials, many restorative options such as composite resins, all-ceramic crowns, and ceramic veneers have become available. The current challenge in reconstructive dentistry is to obtain excellent esthetic results while preserving the biological structures involved as much as possible. Thanks to the introduction of high-strength etchable dental ceramics, clinicians and technicians have materials and procedures at their disposal that allow them to restore esthetics and function through a minimally invasive approach. New-generation all-ceramic restorations and adhesive systems allow a greater preservation of residual hard tooth structures, especially with regard to single elements. This article describes a vertical preparation technique for ceramic veneers. Currently, no dental material can exactly match the unique properties of dentin and enamel. Recently, a revolutionary approach was introduced in which a real tooth was utilized in combination with computer-aided design/computer-aided manufacturing (CAD/CAM) technology to obtain a natural CAD/CAM restoration. After 4 years of clinical service, the case was reevaluated and revealed an optimal condition of the biomimetic restoration. Objective: The aim of this study was to measure the clinical crown, anatomical crown, and amount of gingiva covering the enamel of anterior maxillary teeth with soft tissue cone beam computed tomography (ST-CBCT) and thus propose a protocol for the application of this noninvasive method for the planning of esthetic crown lengthening procedures to prevent undesired root exposure. Materials and methods: Ten young patients (mean age 22.8 years) requiring esthetic crown lengthening surgeries but not restorative procedures were included in this study. The ST-CBCT images were analyzed with an image editor and analysis software (Pixelmator 3.2), and the clinical crown, anatomical crown, and amount of gingiva covering the enamel were measured. Results: The mean value of the length of the anatomical crowns of the central incisors, lateral incisors, and canines were 11.06 mm, 9.55 mm, and 9.77 mm, respectively. Thus, the canines were approximately 1.3 mm shorter than the central incisors. Conclusion: It was shown that ST-CBCT is a useful tool to assess the actual length of the anatomical crown and the amount of gingival tissue that needs to be surgically removed in an esthetic crown lengthening procedure to prevent undesired root exposure. Thus, ST-CBCT is a helpful noninvasive procedure for the planning of esthetic crown lengthening surgeries, making it possible to better predict their final outcome. The aim of this case report was to treat eight simultaneous recessions that caused an unesthetic smile in a 27-year-old orthodontically treated female patient and to restore the anterior maxillary teeth in the esthetic area. The treatment consisted of bilaminar mucogingival surgery with a palatine graft and a collagen matrix graft (Mucograft, Geistlich). At 24 months, complete root coverage was achieved in all treated sites, with an increase of keratinized tissue (KT), complete resolution of hypersensitivity, and a high level of esthetic satisfaction. This case report shows that it is possible to correct multiple unesthetic recessions in one stage thanks to the combination of a connective tissue graft (CTG), a collagen matrix graft, and a coronally advanced flap (CAF). Background: In clinical practice it is common to observe adjacent multiple gingival recessions (MGRs) associated with noncarious cervical lesions (NCCLs). The aim of this 2-year case report was to describe the full-mouth treatment of a patient affected by MGRs and NCCLs, with a combined restorative-surgical approach using a coronally advanced flap (CAF) and a xenogeneic collagen matrix (CM). Method: Before surgery, a composite restoration filled the deepest portion of the NCCL defects and was finished at the level of the maximum root coverage (MRC). The surgical technique adopted for the root coverage procedures was CAF for MGRs without vertical releasing incisions in the maxilla, and with one vertical releasing incision in the mandible. The CM was positioned at the level of the cementoenamel junction (CEJ), and sutured at the base of the anatomic de-epithelialized papillae. The flap was shifted coronally, providing complete coverage of the CM, and sutured coronal to the CEJ with a variable number of sling sutures. Results: At 2 years, complete root coverage was achieved in all treated sites, and the patient reported complete resolution of dental hypersensitivity. 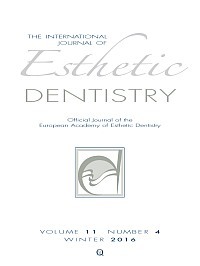 In the questionnaire, the patient-reported outcome showed a high level of esthetic satisfaction (mean score: 9.6; range: 9 to 10), and the objective esthetic evaluation with the root coverage esthetic score (RES) system showed a very high result (mean: 9.4). Conclusions: The suggested combined restorative-surgical approach provided successful root coverage and a favorable esthetic outcome in the treatment of MGR associated with NCCLs. The present case report describes the application of the connective tissue graft wall (CTGW) technique for the treatment of deep lingual gingival recessions associated with probing pockets and bone loss. Two deep lingual gingival recessions affecting the mandibular central incisors associated with severe lingual attachment and bone loss were treated. The surgical technique comprised a connective tissue graft (CTG) placed below a trapezoidal-type coronally advanced flap (CAF) acting as a lingual soft tissue wall of the infrabony defect. One year after the surgery, clinically significant root coverage, an increase in lingual keratinized tissue (KT) height and thickness, and clinical attachment level gain were achieved in both treated teeth. This case report encourages the application of the CTGW technique to improve both root coverage and regenerative parameters in lingual gingival recessions associated with severe attachment and bone loss.